Planned Swansea Bay tidal lagoon. The outcome of the Government's independent review into the feasibility and practicality of tidal lagoon energy in the UK is expected to be released in November. Ahead of its release Lara Moore at Ashfords LLP provides a brief overview of tidal lagoon energy, the importance of the outcome of the government review and some of the challenges faced. What is tidal lagoon energy? The basic structure of a tidal lagoon is a breakwater containing a bank of hydro turbines, built out from the coast in a 'U' shape. Electricity is generated on the incoming and outgoing tides (four times a day) due to the difference in sea-water levels inside and outside the lagoon. As the tide rises, water flows into the lagoon through the turbines generating electricity. The turbine gates are then shut keeping the water inside the lagoon. As the sea level falls outside the lagoon due to the receding tide, the turbine gates are opened and sea-water flows back out through the turbines generating further electricity. Parts of the UK coast experience some of the largest tidal ranges in the world, making it an ideal location for tidal lagoons. Tidal lagoon energy is an attractive source of renewable energy partly because the tide is predictable (high and low tide times are known) but also because the potential benefits extend further than electricity generation. The breakwaters themselves can provide further public benefits, both as coastal or flood defences and public leisure space. Despite the potential benefits, the progress of tidal lagoon energy in the UK has been agonisingly stop start. Nevertheless the UK's first tidal lagoon site, Swansea Bay, received consent through a Development Consent Order in June 2015 (a marine licence is still required). If constructed, it will be the first tidal lagoon in the world and the UK will be well placed to become world leaders in the field. 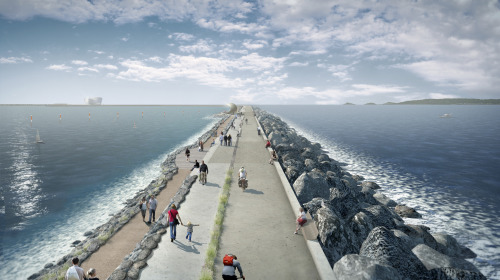 The Swansea Bay Tidal Lagoon is a 350 MW prototype project, of 16 hydro turbines in a 9.5 km breakwater wall, which its developer's say would generate electricity for 155,000 homes for the next 120 years. The scheme cost is approximately £1.3 billion and forecasts indicate that the lagoon could bring 2,200 jobs in the five years it would take it to be built. If the project is successful, there are a further five larger tidal lagoon projects planned at Bridgwater, Swansea Bay, Cardiff, Newport, Colwyn Bay and West Cumbria. The proposed 3000 MW, £9 billion scheme at Cardiff would come forward first to begin the consenting process in 2018 and, because economies of scale apply, the developer's claim that such a scheme will have a strike price per megawatt hour below that of nuclear energy (3200 MW Hinkley Point C), wind or solar power. If correct the impact on the UK energy sector is likely to be significant. Why is the outcome of the Government review important? The Government's decision to undertake an independent review into the feasibility and practicality of tidal lagoon energy in the UK came on the back of ongoing delays and uncertainty surrounding the Swansea Bay Tidal Lagoon, following the then Prime Minster, David Cameron, expressing concerns that the cost of the technology may be too high. Following the outcome of the review, the Government will make a decision on whether to back the Swansea scheme with a contract for difference. This decision needs to be considered in the context of the vote to Brexit in June this year. Since then, the political landscape has shifted significantly. The contract for difference decision will now be taken by the new Department for Business, Energy & Industrial Strategy and whilst there is optimism that the outcome of the review will be positive, it is not yet clear whether tidal lagoon technology is favoured by Theresa May’s administration. The successful delivery of tidal lagoon energy faces a number of challenges. Most of which are shared in part with other parts of the UK Energy Sector. For example, issues with grid capacity and energy storage, are amongst the challenges faced by all. However, there are a number of additional challenges faced by marine energy projects, which are magnified when the technology involved is new. These challenges are mainly related to the complexities of obtaining (and retaining) the required development consents and related risks arising in respect of funding and construction contracts. In England and Wales, marine energy projects with a generating capacity of more than 100 MW are classed as Nationally Significant Infrastructure Projects ('NSIPs') and are consented through the Development Consent Order ('DCO') process. One of the other consents required is a 'marine licence'. In England if the DCO application is successful, a 'deemed' marine licence is granted as part of the resulting DCO. However, in Wales a separate marine licence is required from the Marine Licensing Team of Natural Resources Wales (NRW). A project cannot go ahead without both consents. The consenting process itself is complex, however an additional layer of complication is added by the fact that a marine licence (including a 'deemed' marine licence) can be revoked, varied or suspend, by notice from the relevant regulator (Natural Resources Wales in Wales and the Marine Management Organisation in England), at any time for a range of reasons including; navigational safety, change in circumstances relating to the environment and the catch all 'for any other reason that appears to the authority to be relevant.' This can occur long after the judicial review period has passed. Conditions imposed in the marine licence are used to control construction and future operation. If the marine licence is varied, conditions may be altered or entirely new conditions added. This can cause difficulties, because contracts for the supply of services and goods are usually entered into with risk allocated on the basis of the marine licence as granted (if the marine licence is considered at all). Such contracts need to deal with the risk of a marine licence being varied, suspended or revoked in such a way as to make the continued construction or operation of the development unviable or significantly altered. The same considerations apply in relation to funding agreements for marine energy schemes. Variation, withdrawal or suspension are may well affect viability, timescales for return on investment or in a worst case scenario a project which cannot proceed. Again these risks should be considered in such agreement. Whilst, relevant regulators seek to avoid varying, suspending or revoking marine licenses where possible (unless the applicant has itself applied for a variation), it is not unheard of and new marine energy technologies are at more risk than established technologies due to the lack of detailed information regarding their environmental impacts, which may only become better understood once they are in operation. Indeed, both the RSPB and the Wildfowl and Wetlands Trust have stressed the importance of monitoring the effects of the Swansea Bay Tidal Lagoon before any larger schemes are brought forwards. Whether the tide is rising or falling, tidal lagoons have huge potential. Therefore it is hoped that there is a positive outcome to the review and construction on the Swansea Bay Tidal Lagoon commences in 2017. Lara Moore is an Associate at Ashfords LLP.